TVS are the exclusive distributors of Indelec’s Prevectron® ESE or Early Streamer Emissions lightning protection units. ESE protection differs from conventional systems by providing both proactive and area protection for direct lightning strikes. The Prevectron® unit operates by sensing the electrostatic field and detecting when a lightning strike is about to happen. 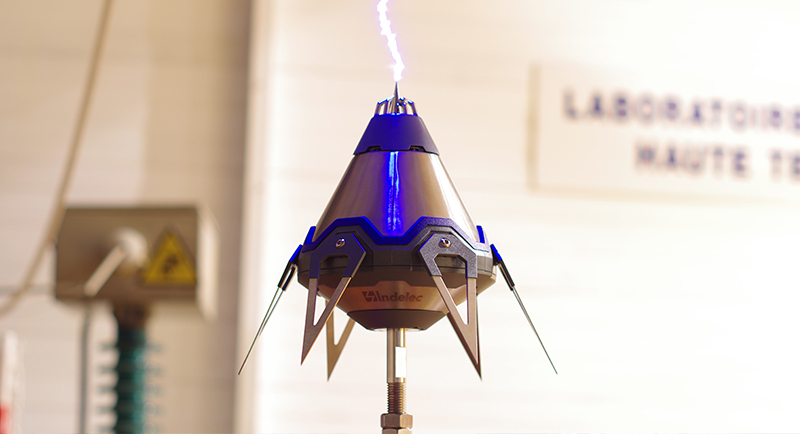 As the lightning downward leader takes place, the unit releases an upward leader charge to meet the lightning strike, thereby “collecting” the strike and dissipating it to earth. The Prevectron® not only protects the striking point, but a radius of up to 79m at protection level 1, depending on the unit model.